In the introduction to his book, Bois posits that to concentrate solely on the formal elements of a work of art (line, color, texture, value, etc.) as it’s defining content can be a dead end, but so is a strictly theoretically approach disinterested in the physical qualities of an artwork. It is both of these realities in accord with each other that truly account for an artwork’s totality. Examining the medium of painting at the end of a millennium and after the eclipse of High Modernism, the book offers artists fresh insights on how to move forward. Seen alongside contemporary realities like the saturation of images, digital, and virtual networks, and the dictates of the art market, the book is more prescient than ever. 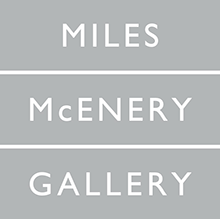 Upon entering the Ameringer | McEnery | Yohe Gallery in Chelsea, Evans’s show is an overload of visual, diaristic, and statistical information. 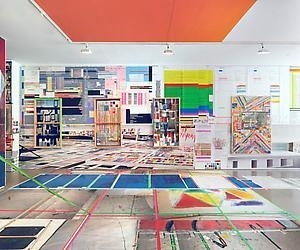 A quick way to orient oneself in the space is to identify nine large paintings, more or less traditionally hung in the front and rear galleries, and note how the paintings are conceptually tethered to an array of installation elements on the floors, walls, and internal areas. From there, a viewer can see connective threads between the contents of Painting as Model and the installation where Evans doesn’t use the book as a theoretical manual as much as let the ideas wash over him. Concentrating on three essays about Matisse, Mondrian, and Barnett Newman, Evans fluidly ties together words and pictures from Painting as Model with his own art making practices and autobiographical material. The exhibition is a tour de force, a rendition of mental and physical processes demonstrating ideas gleaned from the book and actualized in the work. In the discreet paintings, Evans appears to be using the scuffed and littered surfaces of his own studio walls or floors as subject matter. Each painting is overlaid with assorted items at their actual size: swatches, notes, photos, prints, rulers, drips, scribbles, spills, and yards of colored tape. They are painted in a trompe l’oeil manner with the picture plane serving literally as a flat surface and these illusionistic images are cross referenced with their physically real counterparts strung throughout the gallery. The ephemeral and factual elements with allusions to the creative process and external world bring to mind Sylvia Mangold’s early works depicting tape, yardsticks, and floor planes and Manny Farber’s later still life’s that teem with incident. Even so, Evan’s paintings with their more radically shifting surfaces launch us into the more nebulous realms of immersive media and cyberspace. In the large, front gallery, the left wall is covered in a Mondrian grid, the back with a depiction of Matisse’s “Romanian Blouse” (1940) and these images reappear altered on a central column and in many other sections of the installation. The right wall is bisected with spreadsheets at top that spell out such things as the art world’s 200 super collectors, derivatives and net worth around various artworks, and Evan’s own curatorial notes and encounters. At bottom there are installation shots from other shows where Evans has reproduced the books from his own library. Many images are distorted or defaced and commingle with candid shots of various artists and models from high and low strata of society. Tape likely used in the paintings for stenciling appears recycled, stuck to the gallery walls or marking off sections of the rooms. As we put all of this together, it becomes clear that what happens privately in the studio is in direct connection to what happens publicly. One senses Evan’s painting existing among a world of images, even the painting’s constitutional formal parts are regurgitated as images and self-generating. Evans has been known in his practice to reconfigure his work adding new components or remaking an installation as his work traverses galleries and museums, the art market or moves in and out of his studio. And it’s as if Evans’s tape, thread and castoffs are formal elements on the move, with the artist and artworks coexisting in a ubiquitous, flowing network. In proximity to Bois’s book, we consider the time and the place that figured into the radical daring of both Newman’s and Mondrian’s stripes and grids, what influenced them and propelled their art toward something that hadn’t been done before. And, we remember that both of these artists utilized tape to work out their compositions. All the while, actual tape, with its rhymes and rhythms inherent in the bold colors, planes and contours and landscaping potential zigs and zags throughout the gallery. There are structural elements in the show that connote the glowing screens and floating windows of computers. Evans has constructed vitrines made of transparent plexiglass scrims and viewers are steered toward looking through these in order to make out pictures facing inwards or to see objects entombed within the cells. Likewise, three wooden rectangles, that look like painting supports turned backwards, hang on a wall to resemble the windows of Evan’s studio looking out to traffic on Houston Street. Each is sized with a photographic depiction of a glass pane adorned with colored snippets of transparent tape and paper that cleverly inverts the idea of painting plane as window onto the world. SincePainting as Model’spublication, Bois hasnoted his appreciationof the art historianRosalind Krauss’s observations on Jackson Pollock’s drip paintings. How Pollock by deploying gravity and painting with a stick did away with an autographic, gestural mark. And how by painting on a horizontal plane, Pollock asserted the real over the imaginary to the degree that he introduced trash into his compositions (cigarette butts, nuts and bolts, etc). These interpretations, signaled a twist in what had formerly been predominantly formal readings of Pollocks work, and Evan’s work takes off from these possibilities. Bois also asserts the importance of a dialectic, how in order to clarify his own positions on art, he found it useful to readClement Greenberg’s clear minded and rigorous criticism even if he saw in it a failure to see beyond a solely formalist reading of artworks. The polemics governing either a formalist or anti-formalist position can have a deadening either/or rigidity. As a painter, I find Evans’s work fascinating because he hasn’t thrown the baby out with the bath water, the materiality of paint matters to him even as he has found ways of linking painting to Processand Transitive practices. The sheer painterly messiness and “more is more” aesthetic of Evans’s installation is refreshing and ambitious, sharing the sprawling formal lexicons seen in installations by Jessica Stockholder orJennifer Bartlett. Entering or leaving the gallery, a visitor comes across a portrait of Evans hanging high on a wall across from the entrance. It was interesting to discover on Facebook, soon after the show’s reception, someone had photographed the artist at his opening standing beneath his own image. This double self-portrait now making the rounds on social media is an image too good not to be used again, realized anew in different contexts and freshly reconsidered.